The ‘mate’ is commonly made from a natural gourd, although other types are available e.g. wooden cups. It is important to cure natural gourds before use, this increases the life of the cup, and prevent it from splitting, it also enhances the flavour. See our guide how to cure your gourd. 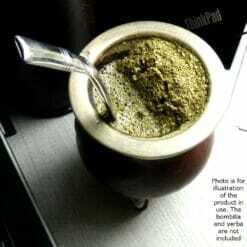 If you’re interested you can read more information in our article: Mates, mates, mates – all you need to know about your yerba mate cup. For instructions on how to prepare the perfect brew read our guide how to prepare yerba mate.